Premium Compatible Label Tapes for the Brother P-Touch 9700PC printer. 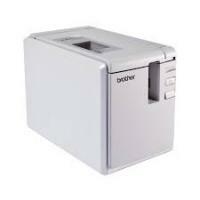 The Brother P-Touch 9700PC is a desktop barcode and label printer which is ideal for the permanent labelling. The printer produces high-quality, durable laminated labels that can resist chemicals, moisture, fading and is able to sustain in changing temperatures or harsh environmental conditions. The printer is compact in size as it measures 116 x 193 x 140 mm. The printer weighs 1.57 kg and comes in white and grey housing. An automatic cutter is integrated to cut the labels after printing. The printer has serial and USB ports for connectivity. The printer can handle tapes of width up to 36mm and length up to 8m. The printer can save resources and time with the use of Brother P-Touch 9700PC label tapes. As the printer uses thermal transfer technology, it doesn’t require a separate ink or toner cartridge. The printer can print on plastic laminated labels that come in a variety of colours and types. It supports printing on different label tape widths that range from 3.5 to 36 mm. The Brother P-Touch 9700PC is a compact machine with a small footprint so that it can easily fit in the small home offices. If one need labels that has professional quality, especially with small font sizes, then the high-Resolution mode is one of the features in the favour of the printer. Q. I have connected multiple printers of the same model type that is Brother P-Touch to one computer but I am only able to print from one of the machines. Why? A. This is because each printer is assigned a unique serial number when you connect another printer to your PC, it gets automatically recognized as a different machine. When first printer is installed on a PC, Brother P-Touch printer driver is created. If you connect the additional printers of the same model to the PC, new printer drivers for the Brother printer with (Copy 1) and (Copy 2) will be created. You need to make sure that you are selecting the correct printer driver for the printing application according to the printer you are currently using. Q. How can I return the non-faulty items, if I have ordered for the wrong Label Tapes for my Brother P-Touch 9700PC? A. You can easily return an item if you have ordered for the wrong one. Please note that an item should be returned in its original and undamaged packaging. If an item is returned in its original state and is fit for resale, we will offer you a refund in accordance with our refund policy. After returning an item you can order for the new Brother P-Touch 9700PC Label Tapes that are compatible with the machine. Q. The Brother P-Touch 9700PC Label Tape is entangled in the machine, or the top and base layers of the laminated tape are misaligned. What can I do to resolve this issue? A. To solve the problem, make sure the underside of the tape cassette is completely touching the base of the compartment. The tape becomes entangled in the machine and becomes stuck in the cassette. The text is printed on the upper part of the label and on the lower part of the label in case of non-laminated tapes. The top and base layers of the laminated tape become misaligned, do the needful to align them. Q. How can I cancel the current printing job? A. To cancel the current job make sure that the printer is on, and then you need to briefly press the power button on the front of the printer. Q. The label is not cutting automatically what should I do? A. If the Brother P-Touch 9700PC Label Tape is not cutting by itself you can use to cut it manually. When one is using Fabric tapes or non-laminated tapes, the label is not cut automatically. After printing, remove the tape cassette from the machine and use scissors to cut the tape. Make sure to read the instructions provided with the tape and observe the precautions carefully. Q. How to install the Tape cassette in the Brother P-Touch 9700PC? A. Follow the steps below for the procedure to install the tape cassette. Hold down the power button on the front of the printer until the power lamp is off. Press the cover release button and open the Brother P-Touch 9700PC Label Tape compartment cover. Install the tape cassette. Make sure that the end of the tape feeds under the tape guide. If the ink ribbon gets loose, use your finger to wind the toothed wheel in the direction of the arrow given on the cassette. Slightly close the tape compartment cover and press the power button on. Q. The printer does not print or printing error is received. What should be done? A. If the printer does not print check that the interference cable is connected correctly and that the tape cassette is installed accurately. Most of the print related errors occur when the connections are not done properly.